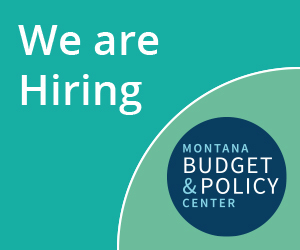 If you’ve been following our work, you know that we are dedicated to passing Medicaid expansion because we know it will help our state’s economy provide up to 70,0000 working Montanans with affordable coverage, including the individuals stuck in the health coverage gap. Last week, the Governor released his budget and included Medicaid expansion among his top priorities. He is calling his plan the Healthy Montana Plan. He says it is “an innovative, uniquely-Montana alternative that will expand Medicaid coverage, reduce health care costs, and increase access to quality health care across Montana.” You can read some of the articles on the announcement here, here, here, and here. We are in the process of analyzing information and drafting a report to help explain the Governor’s Healthy Montana Plan. But since it is based on the Healthy Montana Kids (HMK) plan, we thought that would be a good place to start and a great wonky word. In 1997, the federal government established the Children’s Health Insurance Program (CHIP). The program was designed to cover uninsured children in families with incomes that are modest but too high to qualify for Medicaid. Unfortunately, there was a waiting list for children who were eligible but not enough funding. Then in 2008, a group submitted a ballot initiative – Healthy Montana Kids I-155 - to the voters. The idea was to expand CHIP by using premium taxes paid by insurance companies to make health insurance available to more children. It raised the ceiling of eligibility to families earning up to 250% of the federal poverty level (FPL), which was thought to cover an additional 30,000 children. The initiative passed in all 56 counties and received 70% of the statewide vote. Shortly thereafter, the 2009 Montana Legislature enacted the Healthy Montana Kids program. It brings CHIP and Children’s Medicaid under one umbrella with only one application process. Children below 143% of the FPL qualify for Medicaid and children between 143%-261% qualify for CHIP. What makes HMK so unique – and what makes the Healthy Montana Plan unique - is that it competitively contracts with an insurer to administer healthcare through a private provider network at negotiated rates. This kind of contract is known as a “third party administrator,” or TPA. The TPA for HMK is Blue Cross Blue Shield of Montana and this contract ensures access to care through the contractor’s extensive provider network. The contractor processes the claims and issues fee payments to providers on behalf of the state. Montana reimburses the contractor for those claims on a fee-for-service basis. HMK now covers 105,000 children in our state. Kids with coverage help keep medical costs down for all of us, and kids with coverage are healthier. Healthier kids mean they do better in school, which will lead to a better work force. HMK has been a great success for our state and we look forward to learning more about how an HMK model can be used to expand Medicaid to nearly 70,000 working Montanans.